The Second Battle of Memphis was a battle of the American Civil War occurring on August 21, 1864, in Shelby County, Tennessee. 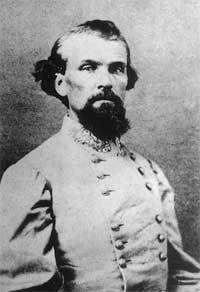 At 4:00 a.m. on August 21, 1864, Maj. Gen. Nathan Bedford Forrest made a daring raid on Union-held Memphis, Tennessee, but it was not an attempt to capture the city, which was occupied by 6,000 Federal troops. The raid had three objectives: to capture three Union generals posted there; to release Southern prisoners from Irving Block Prison; and to cause the recall of Union forces from Northern Mississippi. Striking northwestward for Memphis with 2,000 cavalry, Forrest lost about a quarter of his strength because of exhausted horses. Surprise was essential. Taking advantage of a thick dawn fog and claiming to be a Union patrol returning with prisoners, the Confederates eliminated the sentries. Galloping through the streets and exchanging shots with other Union troops, the raiders split to pursue separate missions. One union general was not at his quarters. Another, General Cadwallader C. Washburn escaped to Fort Pickering dressed in his night-shirt. Forrest took Washburn's uniform, but later returned it under a flag of truce. According to Memphis legend, Confederate cavalrymen rode into the lobby of the luxurious Gayoso House Hotel seeking the Yankee officers. A street in Memphis is named "General Washburn's Escape Alley" in commemoration of the ordeal. The attack on Irving Block Prison also failed when Union troops stalled the main body at the State Female College. After two hours, Forrest decided to withdraw, cutting telegraph wires, taking 500 prisoners and large quantities of supplies, including many horses. Although Forrest failed in Memphis, his raid influenced Union forces to return there, from northern Mississippi, and provide protection. Union General Hurlbut was quoted afterward as saying, "There it goes again! They superseded me with Washburn because I could not keep Forrest out of West Tennessee, and Washburn cannot keep him out of his own bedroom!"